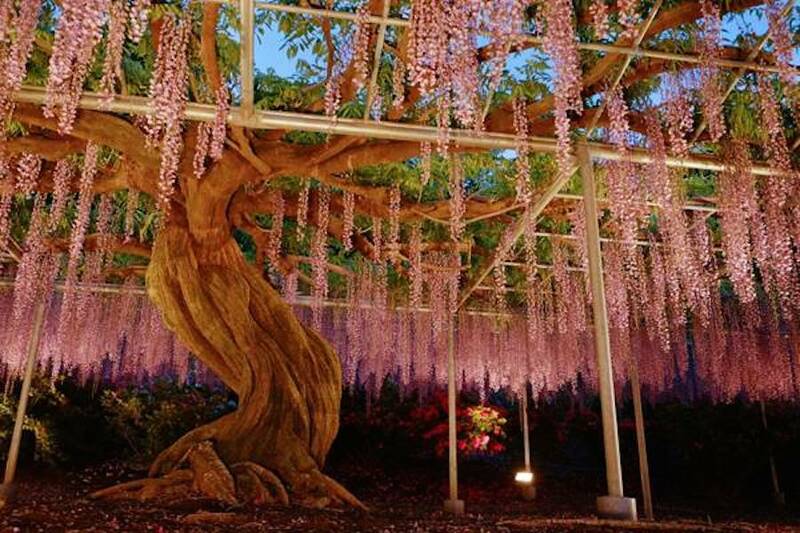 If marveling at Spring’s fledgling flora will usher in warmer weather quicker, here’s something to ogle. The wisteria blooms at world-famous Ashikaga Park, located 50 miles from Tokyo, Japan, gives New York City’s botanical garden a run for its money with its live hanging curtains of cascading petals that render a fairytale-like dreamscape. 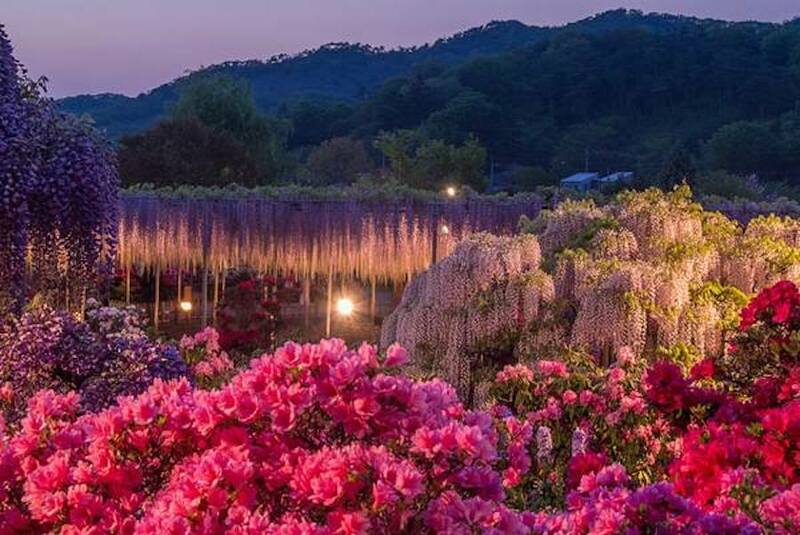 The park is home to Japan’s largest and oldest flowers, a cultural icon locally known as fuji. 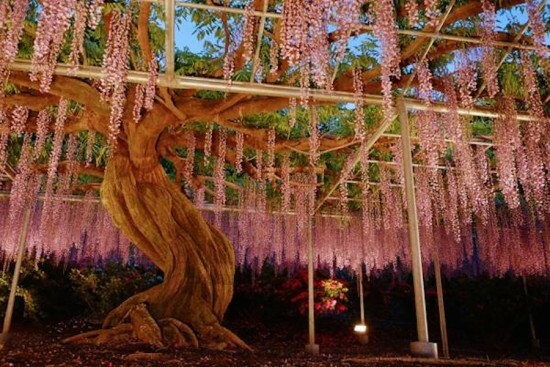 What is now a panorama of pastel petals began as four giant wisteria vines in 1996, which have since grown to cover 11,000 square feet. 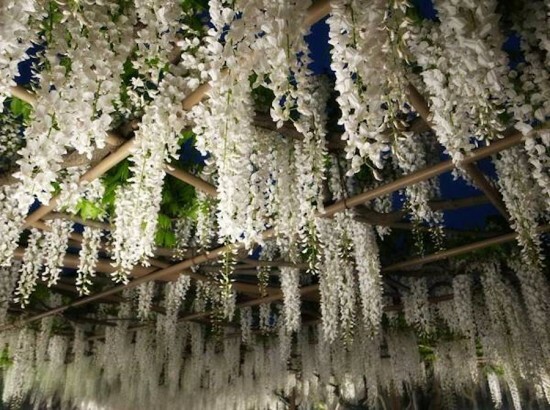 The carefully pruned blooms hang from trellises and are grouped in clusters, and with proper manicuring, can grow upwards in tree form rather than climb surfaces. Related to the pea and native to North America, China and Japan, the climbing plants can be seen in their best light from mid-April to mid-May, when tourists from all over the world throng the park. The 291 foot-long Tunnel of White Wisteria envelops visitors from all sides, while the Giant Wisteria is a living umbrella whose multi-colored shade spans 118 by 118 feet. 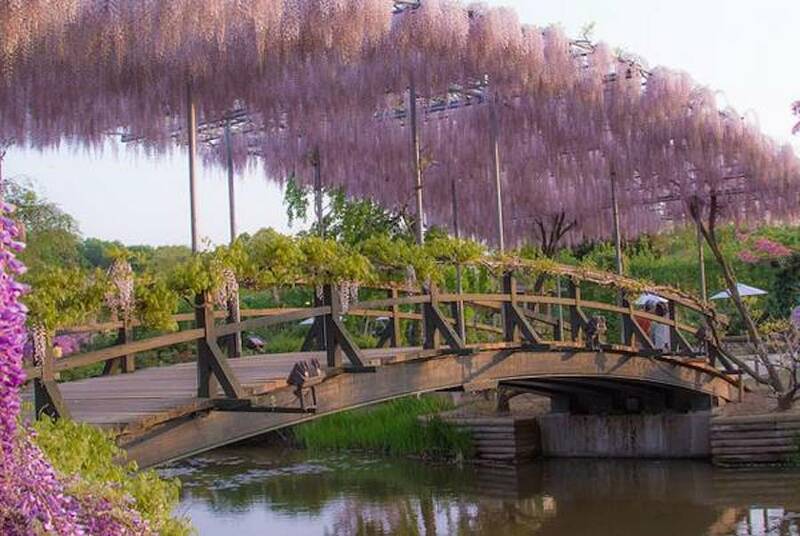 Meanwhile, the Yae-fuji wisteria trellis of purple blooms resembles hanging grapes, but the main attractions are the white wisteria “Waterfall” and the yellow Kibana-fuji. 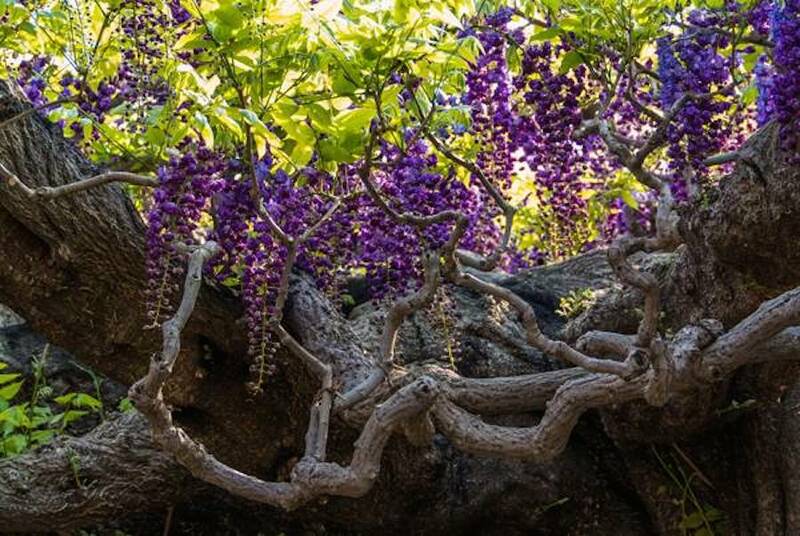 One hundred and sixty of the wisteria plants are more than 60 years old, while one plant has reputedly attained the tender age of 144. Fuji start off as light pink blooms, which then become purple, white, and then yellow. Beneath the surface, 260 tons of charcoal is buried, which fertilizes the soil and helps to purify the air much the way ash from a newly-erupted volcano yields richer earth. An awe-inspiring experience redolent of scenes from Avatar, the park admits adult visitors for around 1,000 yen, depending on the season.